There was little market reaction to Emanuel Macron's widely-anticipated big victory in the French presidential election. The euro actually retreated somewhat, in a "sell the news" dynamic. European equities ended the week mixed. European bonds were somewhat more interesting. Bund yields declined three bps, while Italian yields jumped nine bps. "Risk On/Risk Off" analysis was rather inconclusive this week, though there were some indications of waning risk embracement. U.S. equites came under modest selling pressure. The S&P500 declined 0.3%, while the broader indices were weaker. The midcaps fell 1.1%, and the small cap Russell 2000 declined 1.0%. With Macy's earnings badly missing estimates, retail stocks came under heavy selling pressure. This sector has given the bears a bit of life. Financial stocks were also under notable pressure. The banks (BKX) fell 1.3% and the broker/dealers (XBD) lost 1.5%. The Transports were hit 2.1%. The general market was resilient in the face of ongoing Washington dysfunction. It's not that surprising that President Trump's firing of FBI Director Comey had a much greater impact within the media than in the markets. It's my view that markets are more dominated by liquidity flows and speculative dynamics than the Trump agenda. As for speculative dynamics, the Nasdaq 100 (NDX) and Morgan Stanley High Tech Index (MSH) traded at record highs this week, while the Semiconductors (SOX) are within striking distance. For the week, the NDX gained 0.7% (up 16.9% y-t-d), the MSH rose 0.6% (up 19.6%), and Semiconductors surged 3.4% (up 15.3%). Financial stocks were at least somewhat weaker on modest downward yield pressure. Ten-year Treasury yields fell dipped two bps to 2.33%. One could see a faint bid to safe haven assets supporting the fledgling Risk Off thesis, although the yen (down 0.6%) this week didn't indicate risk aversion. U.S. equities market leadership has clearly narrowed. Monday from Bloomberg (Samuel Potter): "U.S. stocks ended virtually unchanged near all-time highs, while the dollar rose with Treasury yields as volatility drained from financial markets after a convincing defeat of populism in France's presidential election. The CBOE Volatility Index slumped to its lowest closing price since 1993. The S&P 500 Index rose by less than one point to close at a fresh record." There were a number of articles discussing the VIX's "lowest closing price since 1993." There was the typical focus on a stable U.S. and global growth backdrop and buoyant corporate profits. What's missing from the discussion is the reality that global markets have developed into a sophisticated financial Scheme. Going back to early-CBBs, I've devoted a significant amount of analysis to contemporary finance and the proliferation of complex risk intermediation, derivatives and market "insurance." It seems rather clear to me that the interplay between contemporary finance and New Age central banking has over years nurtured history's greatest market distortions and asset Bubbles. Past writings have attempted to differentiate actual insurance from market "insurance" such as put options on the S&P500 (key factor in VIX levels). Actual insurance - i.e. auto and home casualty - provides protection against generally independent and random loss events. Actuaries are skilled at using vast historical databases for fairly accurate forecasts of future claims/losses. Policies are priced to ensure sufficient reserves for future losses along with a profit surplus. Securities market "insurance" is an altogether different animal. Market losses are neither independent nor random, but instead tend to unfold in unpredictable waves. Future losses are unquantifiable. Markets generally grind higher only to break lower in episodes that catch most by surprise. As such, losses tend to be biggest when they were expected to be the smallest. With historical data so deceptive, pricing such "insurance" becomes more of a speculative endeavor. And the longer the history of low "claims" the more likely an ugly black swan lurks somewhere in the future. Over the years, I've used the parable Writing Flood Insurance During a Drought. Such enticing returns attract a bevy of players keen to participate in the lucrative insurance business. And, importantly, cheap insurance distorts market activity, in the process spurring progressively risky behavior in the Financial and Real Economy Spheres. In the end, financial and economic Bubbles unfold with a distorted and colossal cheap "insurance" market at its putrid core. Why is the VIX - and other market "insurance" - so extraordinarily cheap? First taking a global Bubble perspective, I would say the foundation of cheap "insurance" rests upon the perception of a relatively stable global Credit backdrop. Financial Conditions remain loose throughout much of the world. Sovereign yields persist close to historic lows around the globe, while Corporate Credit conditions continue to be ultra-loose. Of course, such conditions have been largely dictated by "whatever it takes" central banking with its near-zero rates and massive QE liquidity operations. There is faith, as well, that the heavy hand of Beijing will ensure sufficient Credit to achieve 6.5% 2017 Chinese GDP growth. And, for China and the world, that's become an enormous amount of Credit. Many would counter that the Federal Reserve and others have commenced normalization, with the U.S. central bank even discussing reducing the size of its balance sheet holdings. Yet such measures do close to nothing to dissuade market participants from the now deeply ingrained notion that central banks will quickly resort to zero/negative rates and more big liquidity injections in response to incipient illiquidity worries. Bull markets create their own self-reinforcing liquidity. Bear markets are the inevitable market self-correction after a period speculation and excess. History teaches us that markets cycle through periods of perceived ebullience and abundant liquidity followed by bouts of fear, illiquidity, dislocation and the occasional crash. In the final analysis, market-based Credit and securities-based finance have inflated to such an incredible degree that policymakers can no longer tolerate even the thought of a market down cycle. At least that is the basis for market "insurance" pricing these days. The greatest ongoing criticism I have with contemporary central banking is that it has essentially guaranteed Continuous and Liquid Markets. Markets (after witnessing 2008 policy responses and then five years of "whatever it takes") perceive this guarantee to be stronger today than ever before. And it is this assurance of Liquid and Continuous Markets that has become the pillar of modern derivatives trading strategies and markets. Derivatives markets - particularly for "insurance," risk sharing/intermediation and speculative leveraging - are fundamental to contemporary finance. And much of this boils down to those that sell market "insurance" are dependent upon highly liquid markets that allow the easy offloading ("dynamic hedging") of risk they're previously written. Derivative players must be able to sell securities that will generate the cash-flows to pay "insurance" losses on contracts they've sold (but not reserved for). And it all works wonderfully until it doesn't - until a market episode unfolds where selling begets selling into sinking markets, more hedging, illiquidity and, at some point, counterparty issues. The VIX is low because markets assume that central bankers won't allow any such market illiquidity episode. Yet I believe just such an outcome is likely because of the markets' faith that it's highly unlikely (with the VIX trading as low as 9.56 this week). So let's touch upon what has become a sophisticated global financial scheme. First of all, markets have become Too Big to Fail on a scope so beyond the 2002-2008 period - across securities markets on a global basis. With the perception that central bankers and policymakers will not tolerate a significant market correction or recession, writers of derivative market "insurance" need not factor in the possibility of significant losses into the pricing of their products. It's become Moral Hazzard on an unprecedented scale. There's a major Reflexivity component at work. Cheap market "insurance" spurs risk-taking. Why not push the envelope with risk and employ added leverage, confident that inexpensive protection is readily available? This ensures that loose financial conditions spur Credit expansion, asset inflation, spending, corporate profits, rising incomes and government receipts/spending. Perceived wealth inflates tremendously, if not equitably. Rising price levels throughout the economy support the view that the future is bright, encouraging reinforcing flows into financial assets - further depressing the price of market "insurance." Moreover, a prolonged period of low market yields boosts the relative return appeal of myriad variations of writing market protection (selling flood insurance during a drought). May 10 - Financial Times (Robin Wigglesworth): "The global exchange-traded fund industry smashed past the $4tn in assets mark last month, as the gingerly improving performance of active asset managers this year does little to dent investor appetite for cheaper, passive alternatives. The entire ecosystem now boasts 6,835 ETFs and exchange-traded products (a broader category), from 313 providers, and total assets of $4.002tn at the end of April... ETFs and ETPs gathered a record $37.94bn last month, which was the 39th consecutive month of net inflows and brought this year's total so far to $235.2bn - smashing 2016's inflows of $81bn at this point of the year." I'll pose the question this way: Why shouldn't the VIX be extraordinarily low with "money" now consistently flooding into the ETF complex? In contrast to previous boom periods where flows would swamp active managers (that may have been keen to build cash levels), "money" arriving at one of thousands of ETFs will be immediately and predictively used to purchase securities. Some might be alarmed by what would be viewed traditionally as rather conspicuous market speculative excess. Not these days, however, in the age of central bankers antsy to deploy liquidity backstops. And the more likely that an abrupt reversal of ETF flows risks disrupting the markets, the more confident market operators become that central bankers will act swiftly to thwart sell-offs before they attain momentum. All part of the Scheme. And with rates so low, equities essentially win by default, especially when they have been so outperforming other asset classes. And while central bankers are not likely to resort to the liquidity spigot in the event of minor pullbacks, players have grown quite confident that corporations, with their enormous buyback programs, are anxious to buy on any weakness. CEOs clearly find it more attractive to support this financial Scheme with stock repurchases than to deploy their cash hoards for productive investment with unclear return prospects. What could go wrong? Lots of things. It's a basic premise of Credit Bubble Analysis that market distortions are problematic, cumulative and inevitably resolved. Sooner the better. The central bank liquidity backstop spurs myriad excesses that in the end will expand beyond the capacity of central bankers to sustain system liquidity. There are accumulations of speculative positions, leverage and maladjustment that evolve into Credit and liquidity gluttons. Over time, market misperceptions and distortions become deeply embedded. And, as we've witnessed, the greater the excesses the more confident are the markets that central bankers will have no alternative than to provide liquidity backstops. So, market yields remain stubbornly low in the face of efforts to tighten monetary policy, exacerbating excesses throughout the risk markets and the overall global economy. No Conundrum. I expect U.S. system Credit growth to surpass $2.2 TN this year, roughly broken down by the government sector ($850bn), Business ($750bn), Household Mortgage ($350bn) and Consumer Credit ($250bn). Another big federal deficit is expected, with the perception of a blank checkbook ensuring that deficits inflate until the markets decide otherwise. Rising home prices coupled with low mortgage rates ensure a 2017 expansion of mortgage borrowings. Loose financial conditions and record debt issuance would seem to ensure another big year of Business debt growth. And while there appears to be some tightening in subprime auto and Credit cards, I would be surprised to see Consumer Credit expand by much less than 2016. As such, the relatively stable outlook for U.S. Credit growth certainly supports the global liquidity and market backdrop. The situation in Chinese is altogether different. Credit growth (Total Social Financing and government borrowings) is on track to approach a record $3.5 TN this year. But I wouldn't be stunned neither by $4.0 TN or a crisis-induced rapid Credit slowdown. April lending data was out Friday. Total Social Financing (TSF) expanded $201bn during April, down from March's $307bn. New Loans expanded $159bn during the month, about a third greater than expected. Bank lending took up some of the slack from a sharp decline in various "shadow banking" components. Overall mortgage Credit growth slowed during April. TSF (which excludes government borrowings) expanded a record $1.205 TN during the first four months of the year. From my analytical perspective, China has evolved into the key marginal source of global Credit. Why is the VIX - along with the price of other market "insurance" - so low? Because of the market perception that Beijing these days has everything under control. Notable complacency, yes. At the same time, and making things more intriguing, I don't believe markets are all too confident in China prospects over the intermediate and longer-term. So, we'll continue to monitor closely for indications of escalating Chinese instability. After an "inconclusive" past five days in the markets, Risk On/Risk Off will be monitored diligently once again next week. THE latest revelations of wrongdoing in high places struck Brazil with the force of a Netflix release: they are riveting, but so far have left the real world undisturbed. On April 12th Edson Fachin, the supreme-court justice who is overseeing a vast probe into corruption centred on Petrobras, the state-controlled oil company, authorised prosecutors to investigate eight government ministers, 24 senators, 39 deputies in the lower house of congress and three state governors. He sent dozens of cases to lower courts; they will now consider whether to launch new criminal inquiries into nine more state governors and three former presidents. All the big political parties and most front-runners in next year’s presidential election have been tarnished (see chart). This fresh scourging of the political class comes at an awkward time. Brazil’s worst recession on record has not ended. Michel Temer, who became president last year after the impeachment of his predecessor, Dilma Rousseff, hopes to stabilise the economy by enacting reforms. His approval rating is a dismal 20%; that of his government is ten points lower. Yet the storm of scandal has yet to capsize reforms or sink hopes of an economic recovery. The value of Brazil’s currency, bonds and the index of the main stock exchange weakened after Mr Fachin’s revelations, but only briefly. The extensive new inquiries “had largely been priced in”, says Cláudio Couto, a political scientist at Fundação Getulio Vargas, a university in São Paulo. One reason for that is that Mr Fachin’s targets are only being investigated, not indicted. He based his decision on statements by 78 former executives of Odebrecht, a big construction firm, who testified as part of plea bargains with prosecutors. One testified that Odebrecht funnelled $3.3bn to politicians between 2006 and 2014, the equivalent of 80% of its net profits over the period. Most of this money came from padded contracts awarded to the company by state-controlled entities, including Petrobras. The testimony disclosed by Mr Fachin, and analysed by Brazilian journalists, reveals how much money the politicians allegedly received, to enrich themselves, their parties or both. Guido Mantega, a former finance minister from Ms Rousseff’s Workers’ Party (PT), reportedly got 93m reais ($30m). Aécio Neves, a senator (and potential presidential candidate) from the Party of Brazilian Social Democracy (PSDB), part of Mr Temer’s coalition, allegedly received 65.5m reais. Everyone on Mr Fachin’s list denies wrongdoing. Odebrecht witnesses claim that Mr Temer himself was present at meetings where illegal campaign donations were discussed, which he denies. He is immune from prosecution for any crime he might have committed before he became president. Mr Temer is striving to project an air of normality. The disclosures, he says, are “staggering”, but “we have to move ahead”. He has said he will only dismiss cabinet ministers who are formally charged. 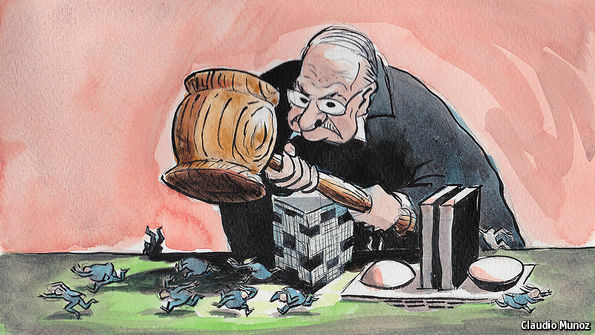 Although the supreme court has given Mr Fachin extra manpower to deal with the massive caseload, that may take months. The compromised cabinet has some breathing room. Congress, too, is trying to conduct politics as usual. Most members of Mr Temer’s centrist coalition, including his Party of the Brazilian Democratic Movement (PMDB), see economy-strengthening reforms as the only way to regain credibility with voters. The reforms themselves are not popular. Plans to liberalise labour laws, for example by deregulating working hours, are not a vote-winner. Still less is a proposal to fix the ruinously expensive pension system, Mr Temer’s most important policy. Trade unions linked to the PT, which is as mired in scandal as government parties, have called a general strike against pension reform on April 28th. Nervous congressmen have forced Mr Temer to compromise. He has agreed to set a lower minimum pension age for women than he had planned (62, rather than 65) and to ease transition rules for men and women. This reduces the prospective savings from pension reform by 170bn reais over ten years. Even so, it should still save the government a substantial 630bn reais over that period. If it goes through, women will retire ten years later than they do now on average. That is probably enough to reassure the central bank, which has been cutting interest rates, mainly in response to lower inflation. Without the prospect of savings on pensions, the central bank might reduce rates more slowly, which would hurt the economy. Mr Temer is fortunate that voters are feeling cynical rather than fired up. 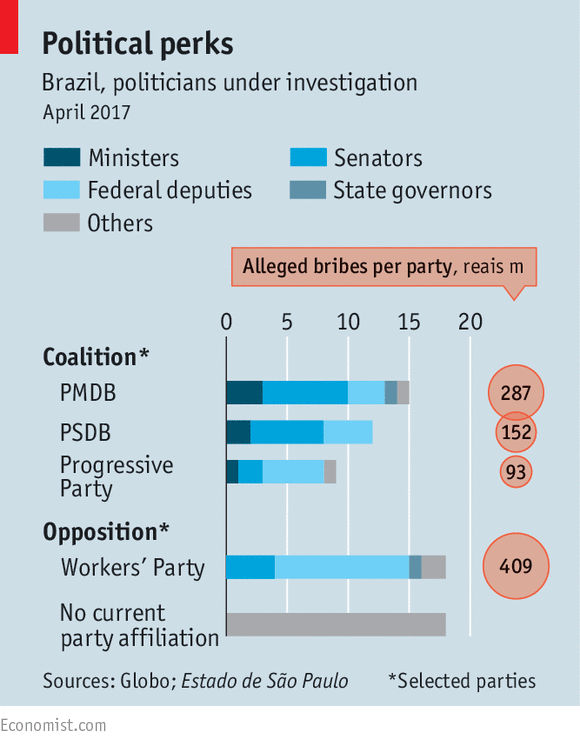 There are no plans to repeat the big anti-corruption protests that helped topple Ms Rousseff last year. Disclosure of Mr Fachin’s list has reassured Brazilians that the dragnet is going ahead without interference. Any attempt by congress to change that would revive the outrage, warns João Castro Neves of Eurasia Group, a political consultancy. Earlier this year the legislature tried to give its members amnesty for taking undeclared campaign donations, but backed down in the face of popular opposition. The uneasy political calm could also end if congressmen start testifying against one another, or if investigations turn into indictments. Mr Temer has so far kept reforms moving forward and the scandal-plagued government afloat. His job is getting harder all the time. Though Saudi Arabia has seen some economic respite lately, it is far from being out of the woods. Nonetheless, the kingdom decided to end public sector salary cuts and restore bonuses for civil servants and military personnel. Reversing course a mere seven months after instituting austerity measures shows that Riyadh cannot bear the political cost. This does not bode well for much-touted efforts to overhaul the monarchy’s political economy. On April 22, King Salman bin Abdulaziz Al Saud reinstated the bonuses after 2016 revenues rose, leading to a budget deficit decline from $98 billion in 2015 to $79 billion last year. According to a press release from the official Saudi Press Agency, the Saudis managed to cut their projected deficit in half during the first quarter of 2017. King Salman also fired his civil service minister and ordered an investigation into alleged abuse of office. The monarch decreed that two months extra salary would be paid to members of the armed forces taking part in the war in Yemen. In an unprecedented move last September, the Saudi regime decided to implement austerity measures due to a sharp decline in oil prices. The measures affected hundreds of thousands of Saudis who make up two-thirds of the national workforce. The government’s rationale for the rather abrupt change of heart now is that the injection of cash to government employees would stimulate growth. However, the fact remains that the allowances are a major drain on the kingdom’s exchequer. The Saudis continue to cut spending elsewhere. In mid-April, Reuters reported that Riyadh’s Bureau of Capital and Operational Spending Rationalization, established last year, was looking into shelving billions of dollars worth of reform and development projects. This means that the Saudi regime is willing to incur the financial cost of placating public servants and military personnel. On April 3, the Cabinet announced a pay increase of up to 60 percent for air force pilots – many who are flying bombing missions in Yemen where a Saudi-led military coalition composed mostly of Gulf Arab states is struggling to restore the internationally recognized government to office. The Saudis likely realized that they could not sustain the entire austerity drive for too long and had to be strategically selective in restoring spending to politically sensitive groups. In fact, the suspension of allowance packages probably was not designed to be a long-term measure. Though Riyadh may not have known when it could reinstate them, it wanted to do so at the first sign of financial respite via a mix of a modest increase in oil prices and other spending cuts. This is because the kingdom’s social contract is structured in such a way that citizens over the decades have grown used to the government paying for much of their needs. Oil revenues have historically allowed the Saudis to afford this kind of spending. This has created a certain expectation among the public that is impossible to alter. The austerity measures are part of the reform agenda spearheaded by the king’s son, Deputy Crown Prince Mohammed bin Salman. Lofty goals aside, the Saudis are realizing that it is extremely difficult to alter a unique political-economic system based on a welfare state that caters to almost all of the average citizen’s needs. Pulling the plug on these financial incentives is very risky under the current regional climate in many Arab states that is marked by civil unrest and armed insurrection. It is noteworthy that none of the monarchies have thus far been affected by this contagion. The Saudis would like to keep it that way, and they know the only way to prevent unrest is to maintain the patronage system. That said, the regime likely is not worried about public sector employees taking to the streets, considering these employees depend on the government for their livelihoods. More noteworthy is that military personnel also had cuts reinstated. This gives some indication of what the Saudi government is afraid of: disloyalty in the bureaucracy or the military. The government does not want to take any chances. The regime has been selling the idea that political activity of any kind could lead the country toward a fate similar to that of Libya, Syria and Yemen. It has also built a reputation for taking care of people’s needs. Riyadh cannot afford to be seen as derelict in this responsibility. A trade-off has occurred between politics and economics whereby the public does not engage in political action because the regime takes care of its economic needs. This in turn gives the regime more stability. While religion has been a major pillar of the Saudi state’s legitimacy, its ability to economically provide for the public has been the other. That Saudi rulers are seen as unable to deliver on the social contract represents a major security threat from within the state. An erosion of confidence in the ability of the current faction of the royal family dominated by the king’s immediate clan and its allies opens the doors for other factions to entertain ideas of a coup, which would explain why special attention has been paid to ensure the armed forces are kept satiated. Therefore, the decision to revive the salary structure and offer bonuses is an early indicator that economic reforms may not be possible because of the political sacrifice they entail, which puts the Saudi regime in a very difficult position. What exactly is the role of a first daughter? That question in Berlin this week had Ivanka Trump fumbling for a reply. Without having ever won a vote, Donald Trump’s elder daughter is now among the world’s most influential people. Her husband, Jared Kushner, is the Trump administration’s plenipotentiary by virtue of his marriage. Both appear to be nice people: friends describe them as “normal”. But their ascent to the pinnacle of US power has no parallel in modern western democracy. The Germans are not alone in wondering what to make of it. From China’s Xi Jinping, to Canada’s Justin Trudeau, and Germany’s Angela Merkel, world leaders are working on the assumption that Mr Trump will keep his daughter and son-in-law in key positions. Others, such as Nikki Haley, US ambassador to the UN, “can easily be replaced”, as Mr Trump quipped this week. But foreign governments think the president’s close relatives cannot be dislodged. They may prefer it that way. Ms Trump was apparently critical in drawing her father’s attention to the human effects of Syria’s recent chemical weapons attack. Her husband is busy sidelining Stephen Bannon, chief proponent of the “America first” doctrine. The couple acts as a curb on the president’s stronger impulses. Ms Trump also serves to humanise her father. This week she co-wrote an opinion piece for the Financial Times piece with Jim Yong Kim, president of the World Bank, to argue for a greater role for women in the global workforce. Following a campaign in which her father made a priority of restoring male-dominated jobs, such as coal mining, Ms Trump plays a useful yin to her father’s yang. It is no accident that Ivanka was the first Trump to make a high profile foreign visit since her father’s inauguration. Mr Trump has still not travelled abroad. Yet there are costs to Ms Trump’s meteoric rise. The first is the reputational hit to US democracy. Presidential relatives often play a prominent role. Doubtless Bill Clinton would have been a powerful “first guy” had Hillary Clinton won. Chelsea Clinton would also have wielded power. But Ms Trump’s position takes the White House family enterprise to new levels. Her German trip showed it up starkly. She sat next to Ms Merkel, Christine Lagarde, head of the International Monetary Fund, Chrystia Freeland, Canada’s foreign minister, and other women there by virtue of their own efforts. Ms Trump’s presence also reminded her hosts of the role of inherited power and wealth in modern American society. Like her father, and her brother Donald Junior, who is co-head with another brother, Eric, of the Trump Organization, Ms Trump is a graduate of Wharton, the University of Pennsylvania’s business school. Nobody suggests she was unfit to attend an elite school. But the fact that her father studied there cannot have harmed her chances. One in four at Ivy League universities are legacy students. That Mr Trump is estimated to have donated at least $1.5m to Pennsylvania University is also salient. Likewise, there is no reason to question Mr Kushner’s academic abilities. But his father, Charles Kushner, donated $2.5m to Harvard University, which Jared attended. To be fair, elites do whatever it takes to gain advantage for their children. But it assumes a different scale when your father becomes US president. The second risk is about the appearance of conflict. Ms Trump has rightly ceded control of her fashion and clothes business to outsiders while she works as a White House adviser. She has also declined to take a salary. But that is unlikely to be enough. It is possible China would have approved Ms Trump’s trademark applications regardless of whether her father was president. It was nevertheless awkward that they received the green light during Mr Xi’s visit to Mar-a-Lago earlier this month. Even the clothes Ms Trump wears can have a big pay off. US retailers quaked when Mr Trump sent a tweet earlier this year criticising Nordstrom for having removed a line of Ms Trump’s products from its stores. Then there is the public relations risk. Ms Trump is right to argue that strong economies are built on equal opportunities. She was also right to criticise the US for failing to provide the right to paid maternity leave. But she will need to show evidence of her influence. Mr Trump’s budget says nothing about paid leave. Ms Trump’s public relations drive could thus quickly boomerang. Instead of arguing women’s case inside the White House, people may come to believe that her real job is to pitch her father’s case to women. At a recent symposium in Philadelphia, former U.S. Surgeon General Vivek Murthy had a question for the audience: Does society consider emotions a source of weakness – or power? “Weakness” was the consensus among those who raised their hands, but it appears that most got the answer wrong. “Emotions are a source of power,” said Murthy at the April 12 event, “Under Pressure: Using Emotion as Power Over Stress,” held by the Leonard Davis Institute of Health Economics at the University of Pennsylvania. “I’m not saying that because that’s my philosophical belief. I’m saying that because that’s what science actually tells us. Take the experience of high-performance athletes. “The key to success is not just physical fitness,” Murthy said. “It’s also emotional fitness. That’s why the mental game is such an important part of how athletes train, and it’s what makes the distinction between those who win and those who come up short.” For example, when a professional tennis match enters the fifth set, he said, victory hinges on the player’s mental game as the competition runs through the final stretch. As surgeon general, Murthy said one of his responsibilities was to provide scientific information so people can make good choices about their health. “It became very clear to me that if we do not address chronic stress in our country, if we don’t look for ways to enhance emotional well-being, then we will be failing to address an important, critical driver of our wellness,” he said. Murthy cited the seminal work of Martin Seligman — a University of Pennsylvania professor known as the father of positive psychology — linking gratitude and other positive emotions to happiness, which can alleviate stress. In one experiment, participants were asked to write down three good things that happened each day for a week. Six months later, they were still happier and less depressed than when they started out. “Gratitude is a really powerful emotion and one that can influence how we look at our lives more broadly,” Murthy said. Feeling socially connected is also important to emotional health. Human beings have evolved to be “socially connected creatures,” Murthy said. “That’s not to say we all have to be extroverts. Whether you are an introvert or extrovert, you still need some degree of social connection. The question is how much.” Back when mankind existed mainly in tribes, he said, those with social connections were more likely to have a stable food supply and more able to protect themselves from predators. “Connection matters. When we are isolated, when we are subjectively lonely, that actually puts us in a stress state because that’s not how our body was built to operate,” Murthy said. “That stress can have a lot of the adverse effects [similar to] stress [coming] from other sources.” It might surprise one to know that alongside chronic illness, poverty, discrimination and violence, loneliness actually can contribute to chronic stress. “The reason loneliness is important for us to think about is it’s right under our noses,” Murthy said. Murthy continued: “The kind of gratification and nourishment that you get from a deep relationship with someone who understands you and whom you understand is different from somebody you friended on Facebook [after you saw them] for two minutes [at] a conference three years ago” and had very little interaction with since then. “Those are not equivalent relationships.” Research shows that online tools can help strengthen offline relationships. “But if online platforms become a substitute and in fact diminish our offline relationships, that’s when things can be a little bit dangerous and we run into challenges with isolation,” he said. Murthy confessed that when he was younger, he didn’t handle stress very well. “I put a lot of demands and expectations on myself. It wasn’t imposed upon me by my parents or teachers. I had a lot of self-imposed standards and I wasn’t always able to meet them — and that was really stressful and it was really isolating,” especially since he tends to be shy, he said. In retrospect, he recognized that “connections can be therapeutic. If I had known that, I would have pushed myself more … to reconnect in times of stress with people who understand me or see me for who I am.” Exercise is also therapeutic, Murthy added. Hand in hand with social connections is recognizing the “power of pausing,” Murthy said. “There are times when pausing is what we need to step back from the craziness of the day-to-day. We are living a life of experiences that are coming at you from mobile devices all the time.” The human heart exemplifies the benefits of pausing, he said. In the systole phase, the heart ejects blood to vital organs such as the brain, lungs and others. In the diastole phase, the heart takes a moment to refill with blood. “Pausing, in fact, is what sustains the heart,” Murthy said. “There is a powerful lesson in there for us.